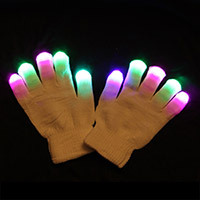 LED Gloves or Rave Gloves are perfect for showing off your skill at the club. 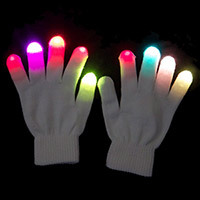 Single color, multi color or color control LED Gloves - pick the perfect set for your needs and start dancing! 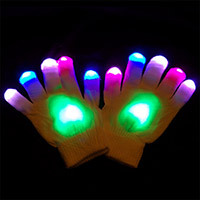 3 LED staggered on each glove finger and 6 flashing modes make these rave gloves glow! 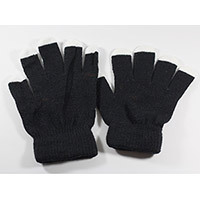 Affordable programmable glove set great for beginners or advanced users who value simplicity. Be the center of your own universe with our Cosmo LED Gloves. 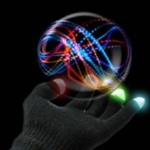 Pink, Green and Blue strobe effects at your finger tips are out of this world! This glove set is as sweet as it sounds. Each finger tip is individually controlled to create a Pink, White, Blue and Green treat. To make it even sweeter we added a 3 mode palm light. 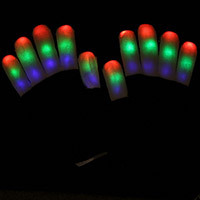 A whole new realm of different light effects are at your fingertips with the six unique patterns in this variation of the multi-color LED glove. 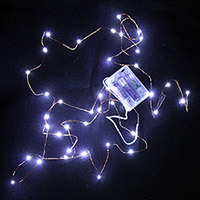 Designed to be even more hynotic with trail-tracing effects that are perfect for lightshows! Freaking awesome black version of our popular Mystical Mitts. The new LED mitts use heavy black cotton/poly with white fingertips to hide dirt and make hands almost invisible in the dark. Each finger tip contains 3 color brilliant LEDs! Upgraded light control unit for superior durability and easier color mode changing! With 15 LEDs in each glove capable of 6 modes, this is the ultimate way to let your hands do the talking! Great for performance use! Can be set to single colors or various multicolor modes! 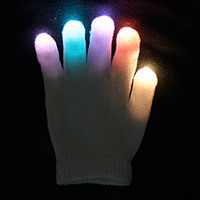 One size fits all stretchy gloves for gloving lights. 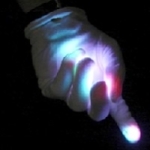 It's all about the strobe effect with these LED gloves. 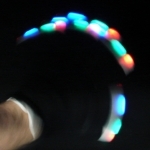 Each finger has a 3 color strobe light with 3 modes.